Blood work data can be used similarly to how you would use data in a business to determine if the system is functioning or failing. The proof is always in the numbers. The real power of using blood tests lies in viewing your long-term health trends. Most people wait until it is too late to start monitoring their health. Waiting until you are sick is like only changing the oil in your car when the check engine light comes on. This lack of attention to maintaining the function of your “car” creates expensive future problems, such as eventual engine failure. Adopting a regular health monitoring strategy to stay healthy will always take less time and cost you less money than it would dealing with a chronic illness. Most chronic diseases are preventable and blood work provides you with a crystal ball so that you can take a look into the future of your health. With this information, you will be able to make the necessary changes to keep your body on a steady course aimed in the direction of health rather than chronic disease. Do you tend to hop from one diet to the next? Or, do you want to know if intermittent fasting or the Paleo diet is worth all the effort? Blood work will be your guide. Stop thinking about supplements as expensive urine and know for sure if they are worth the time and money spent. Blood work creates a window into the inner workings of your body. This window highlights the dysfunctional patterns in the body that lead to chronic disease. When you can identify where the dysfunction is happening in your body it will become clear which diet and lifestyle changes will have the most impact. 1 – Get a comprehensive blood work assessment 1-2 times each year. Click here to opt-in and download the Comprehensive Annual Blood Test List. 2 – Use smaller quarterly tests to make the necessary changes to your diet, fitness routine, stress management, sleep, and supplements. 3 – Compare your results each year to determine the areas of your health that are improving and the areas that need attention. What information can I get from regular blood testing? If you have any nutrient deficiencies increasing your chronic disease risk. Do you have low vitamin D that is increasing your risk of cancer and osteoporosis? The dietary changes that are necessary to prevent disease and increase your mental clarity. Do you need to eat more healthy sources of fat or protein for optimal brain health and athletic recovery? What type of fitness program is best for you. Do you need to incorporate high-intensity exercise or interval training? What supplements will be the most effective to help you reach your health goals. Is your constant brain fog and low energy a result of low thyroid hormone conversion or a nutrient deficiency? Most importantly, knowing your blood work biomarkers removes the uncertainty surrounding your current state of health and will give you the peace of mind that you are taking control of your future health. Why should I get a blood test if I am healthy? The short answer is – to stay that way. It is really important to get a baseline of your health when your body is functioning well. The more data that you have, the quicker you will be able to identify when dysfunction begins. It is common to see changes in blood work before the onset of symptoms. Should I get blood testing done every year? Yes. The real power of using blood work for the prevention of disease is viewing your long-term health trends. How do I know if my blood test is normal? Normal and optimal are two VERY different things when it comes to blood tests. 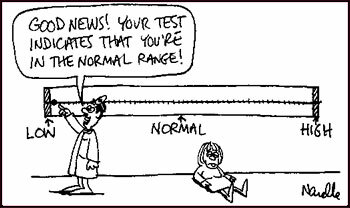 The normal range for a blood test is generally determined based on a bell curve of the average person who goes to that lab. With regular blood testing, you should be aiming for optimal not average. The normal reference range of fasting triglycerides is under 150 mg/dL (1.7 mmol/L). However, a triglyceride level of over 100 mg/dL (1.13 mmol/L) may indicate poor blood sugar control and excessive carbohydrate intake in the diet. Research has also shown that levels below 60 mg/dL (0.68 mmol/L) correlate with increased risk for autoimmune disease and immune system dysfunction. So the sweet spot, or the “optimal range”, for triglycerides is between 60-100 mg/dL (0.68-1.13 mmol/L), not just anything under 150 mg/dL (1.7 mmol/L) as the lab reference range suggests. This is the most important thing to know when it comes to blood testing – Normal DOES NOT EQUAL healthy. Unfortunately, there is not an easy way to determine the optimal range for each test. For some tests, it is good to be closer to the middle of the range while for others it is best to be at the top or bottom end of the range. The way to get the most out of your blood test is to work with a doctor who is trained in using the optimal ranges of blood work. What does a comprehensive blood test cost? There are now many options for getting affordable blood work. In most areas of the world (including the US) a comprehensive blood test is around $250-350 for 60-70 biomarkers. Can I use insurance to get my blood tested? It is possible to use your health insurance to pay for comprehensive health blood testing. How often should I get my blood tested? Most people put more thought and money into their daily coffee habit than they do to their health. Tracking your long-term blood work trends is one important way to make your health a priority. I recommend that my clients get a comprehensive blood work assessment at least 1-2 times each year. Based on your health goals you can use smaller quarterly tests to help make informed decisions about changes to your diet, fitness routine, stress management, sleep, and supplements. How do I get the most accurate blood test? Blood testing takes a small sample of blood from one point in the circulatory system and represents how the rest of the body your is operating. With such a small sample from one moment in time, there are many ways to disrupt the accuracy of your results. 1 – Stick to your normal routine the day before your test. 2 – Do not get your test done on a day that you feel ill unless the test is to determine why you have that specific illness. 3 – Eat a diet that is normal to you prior to your test. Do not get your testing done after a big change your diet, such as during the holidays, after a big party, or after vacation. 4 – Make sure to follow your fasting recommendations. If your test needs to be done while fasting, schedule it for as close to 12-hours fasting as possible. Drinking water during this fasting period is ok and recommended. 5 – Do not start a new exercise routine or do a strenuous workout prior to your test. 6 – Reschedule your test if you suddenly have a poor night’s sleep and this is not a normal issue for you. 7 – Medication and supplement timing is important! For example, if you take a thyroid medication such as Levothyroxine (Synthroid) you should wait to take it until after your thyroid test. Also, the supplement Biotin can disrupt thyroid levels on the test and should be avoided for two days prior to your test. 8 – Dehydration affects your testing results. Make sure to drink at least 8 glasses of water daily prior to and the day of your test. 9 – Avoid alcohol consumption prior to your testing date. BLOOD TESTING PRO TIP: Because the equipment and testing methods change from lab to lab, it is best to continually get your testing done from the same lab if it is possible. Comparing the results from the same lab will create the most accurate trends. How do I Set Up My First Blood Test? You might be missing a health problem that could be easily identified and prevented by doing yearly blood work. Checking your blood each year is a great form of health insurance that focuses on keeping you healthy. I am a Naturopathic doctor specializing in an in-depth assessment of blood work which will help you to finally understand your health data so that you can make more informed decisions about your diet, lifestyle, fitness, and supplement choices. If you are interested in a comprehensive blood work assessment and Treatment Program to improve your mental and physical performance, please call and set up an appointment!